Robert Hurt, IPAC, JPL, CalTech, Keck Observatory, NASA -- larger illustration. as far out as 98 AUs in a highly eccentric and inclined orbit (more). 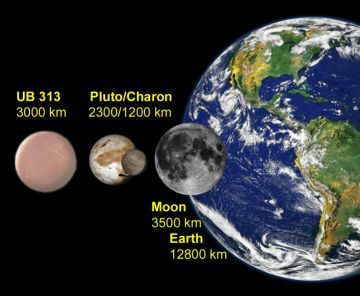 On October 11, 2011, an astronomer announced (at a joint meeting of the American Astronomical Society's Division of Planetary Sciences and European Planetary Science Congress) that Eris is roughly the same size as Pluto, at around 1,445 miles (or 2,326 +/- 12 kilometers) across for Eris compared with a 2009 update of at least 1,453 miles (or 2,338 km) for Pluto, based on measurements from a star occultation last November (ESO science release; Emily Lakdawalla, Planetary Society blog, October 12, 2011; John Matson, Scientific American blog, October 12, 2011; Lisa Grossman, New Scientist, October 14, 2011; and Lellouch et al, 2009). 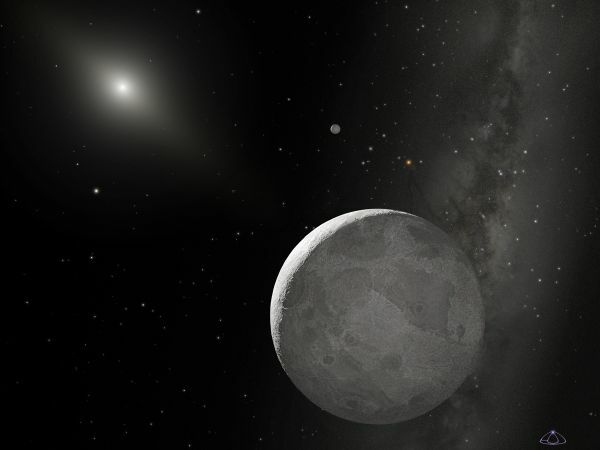 On November 6, 2010, three teams of astronomers using three different telescopes tracking the occultation of a 17th-magnitude star in the north-central part of Constellation Cetus by Eris revealed preliminary results indicating that the dwarf planet may be smaller in diameter than Pluto after all, based on the unexpectedly short times of occultation reported. Eris' mass, as determined from the orbit of its moon Dysnomia, is estimated to be about 1.27 times Pluto's mass, and so if the occultation results are confirmed, then Eris's density must be higher (around 2.52 grams per cubic centimeter) and its albedo (or reflectivity) may be at least 90 percent (Kelly Beatty, Sky and Telescope, November 7, 2010; and Kenneth Chang, New York Times, January 11, 2011). As a result, Eris must be mostly composed of rock (85 percent) with a relatively thin icy mantle (15 percent or around 100 km thick), but as most models of planetary formation at increasing distance from the Sun indicate that it should have a thicker layer of ice if it formed where it is, much of Eris' original ice may have been removed by a massive impact (ESO science release; and Alan Boyle, MSNBC Cosmic Log, October 12, 2011). and both have satellites (more). The 2010 occultation measurements indicate that Eris is highly spherical ("round"). 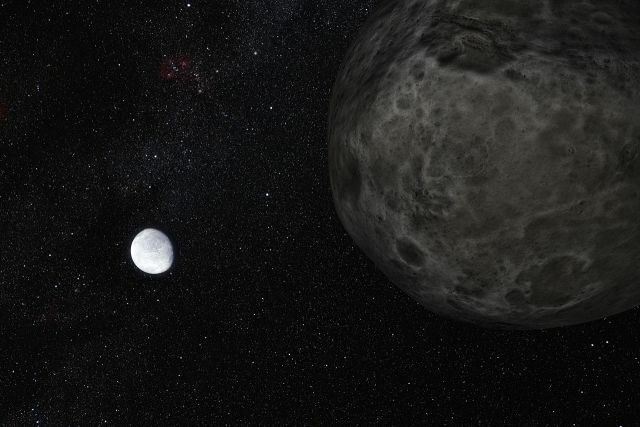 The dwarf planet reflects 96 percent of the Sun's light (a visible albedo of 0.96, compared with 0.136 for Earth's Moon which is as dark as coal). This may be due to a frozen atmosphere that has precipitated out to form a thin, uniform surface layer of nitrogen rich ice mixed with frozen methane (ESO science release). Larger and jumbo illustrations of Eris (source). distance from the Sun (more). 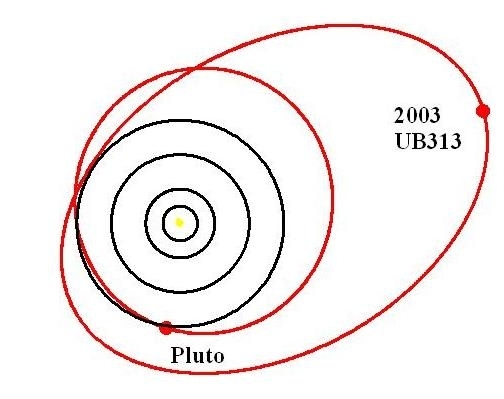 On July 14, 2005, a team of astronomers (including Mike Brown, Chad Trujillo, and David Rabinowitz) announced the discovery of a planetary body (2003 UB313) that appeared to be larger than Pluto (NASA press release; latest news; and Brown et al, 2005, in pdf). 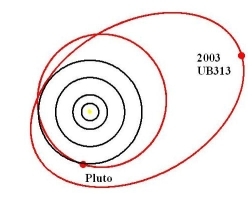 A little over a year later on August 24, 2006, the International Astronomical Union (IAU) voted to classify 2003 UB313 as a "dwarf planet," because it is not massive enough to clear its orbital neighborhood of similarly sized objects. Nearly a month later on September 13, 2006, the IAU announced its official approval of the names of Eris and Dysnomia for 2003 UB313 and its satellite that were submitted by its discovery team. In Greek mythology, Eris (known as the goddess of discord, strife, and chaos) caused a quarrel among the goddesses that sparked the Trojan War, while her daughter Dysnomia was known as the goddess or spirit of lawlessness. Not surprisingly, the discovery of Eris and the finding that it is larger than Pluto have also caused strife in the astronomical community, forcing some astronomers to produce a strict definition of the term "planet" which eventually led to Pluto losing its status as the "ninth planet" that it had held since its discovery in 1930. 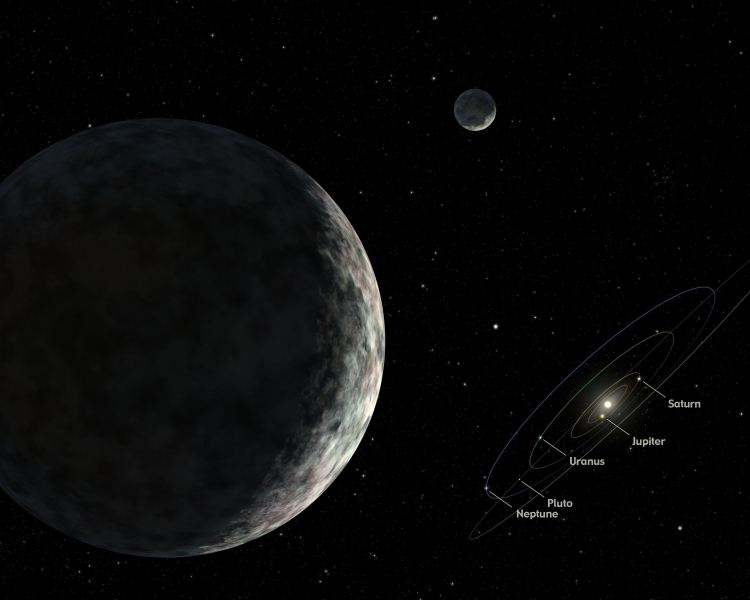 Initally nicknamed Xena, the dwarf planet and plutoid is currently located at around 98 AUs, which appears to be the point of its farthest orbital distance from our Sun, Sol -- a distance that is up to more than three times farther out than that of Pluto or Neptune. However, Eris will eventually move in as close as Pluto and Neptune (around 38 AUs) in a 557-year orbit around Sol that has a semi-major axis of 67.7 AUs. 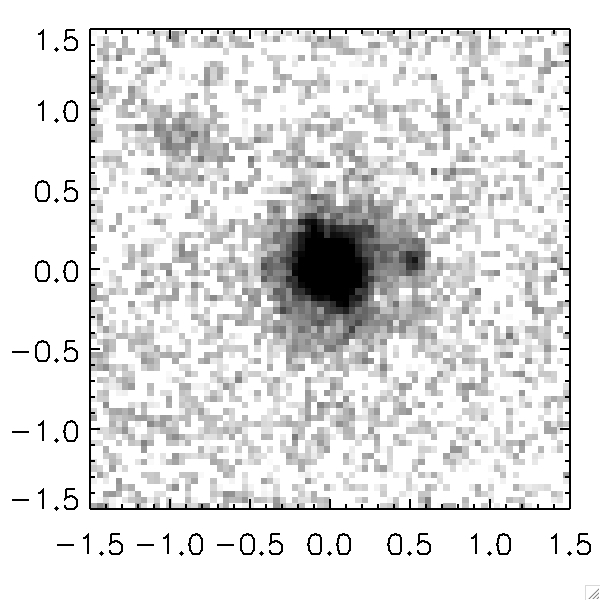 It has an elliptical orbit (e= 0.442) that is more eccentric than Pluto's. The dwarf planet is also tilted almost 44.2 degrees from the ecliptic where most of the planets in the Solar System orbit, and so many astronomers assume that gravitational encounters with a more massive object moved it into its current, highly inclined orbit. 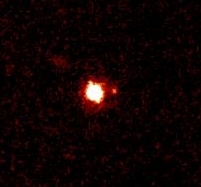 On February 1, 2006, a team of astronomers (including Frank Bertoldi, Wilhelm Altenhoff, Axel Weiss, Karl M. Menten, and Clemens Thum) tentatively confirmed that Eris appeared is indeed around 30 percent larger than Pluto (joint press release with abstract). The largest object found in the Solar System since Neptune's discovery in 1846, Eris was initially estimated to have a diameter of around 3,000 +/- 400 kilometers (1,860 +/- 250 miles), based on infrared light at a wavelength of 1.2 millimeters. This new measurement used radiation emitted by Eris in response to being warmed by sunlight ("thermal emission"), regardless of the shininess of its surface. The infrared findings indicated that UB313 has a reflectivity, or albedo, of about 60 percent, which is similar to Pluto's and suggested that the two bodies have surfaces are made of very similar materials such as frozen methane and nitrogen snow at a temperature of -248 �C or -418 �F. By April, Eris' original discovery team hoped to announce an even more accurate estimate of its size -- to the nearest 50 km or 25 miles -- determined using new images from the Hubble Space Telescope (more discussion and an illustration from news@Nature and Astronomy Picture of the Day; and a simulation of its current location using a Java applet from NASA). 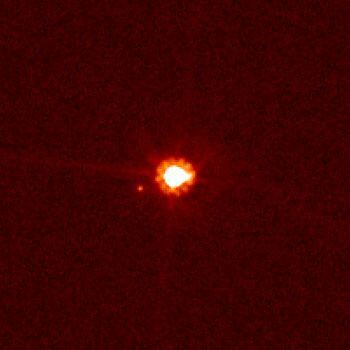 On April 11, 2006, Eris' discovery team announced that they had used the Hubble Space Telescope to determine that the dwarf planet is actually smaller at 2,400 +/- 100 kilometers (or 1,490 +/- 60 miles) wide, which is only around three percent larger than Pluto's 2,320 km (1,440 miles), but this estimate was subsequently revised again. 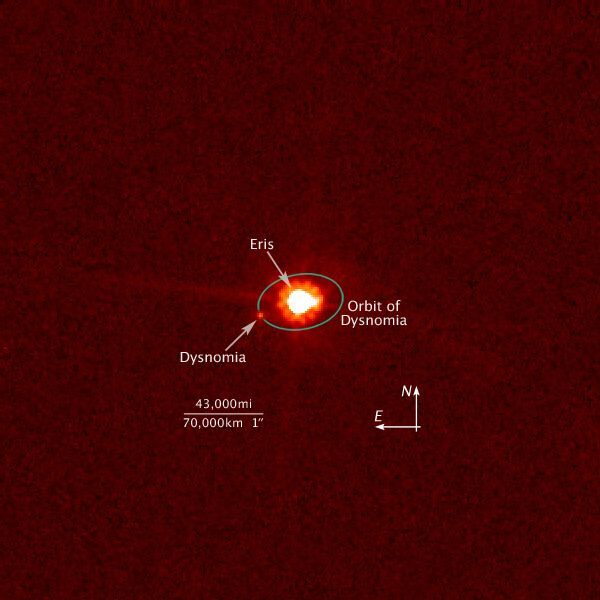 In June 2007, the discovery team that discovered Eris and its satellite Dysnomia announced that recently completed orbit calculations of the two bodies indicated that Eris is 27 (+/- 2) percent more massive than Pluto. 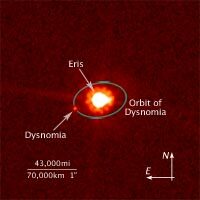 Based on a series of seven observations using the Keck Telescope and the Hubble Space Telescope, Dysnomia's around Eris was found to take almost 16 days. Dysnomia's nearly circular orbit supports the theory that Dysnomia was created from the collision of Eris with another Edgeworth-Kuiper object (EKO), as a gravitationally captured object would be expected have a more elliptical orbit around Eris. Moreover, unlike Pluto, no more moons around Eris were discovered. Lastly, a comparison of Eris' mass and diameter indicates a density 2.3 grams per cubic centimeter, which is very similar to the density of Pluto, the large EKO 2003 EL61, and Neptune's moon Triton (likely to be a captured EKO). Such densities imply that these bodies have a significant rocky composition (more from Hubblesite.org and the Eris discovery team). with a small amount of methane ice (more). On October 6, 2010, planetary scientists at the American Astronomical Society's 42nd annual meeting of its Division for Planetary Science (DPS) announced that the two largest known, dwarf planets and plutoids, Eris and Pluto, are very similar in appearance. 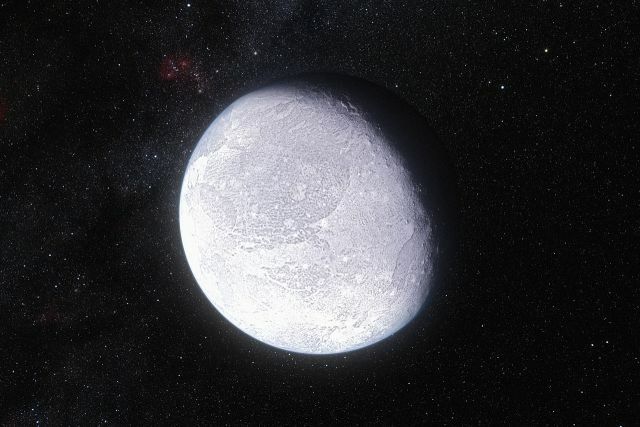 Although Eris is around 170 miles larger in diameter and 27 percent more massive than Pluto, astronomical observations indicate that both are mostly covered (at least 90 percent) with nitrogen ice and a small amount of methane ice, just like Pluto. 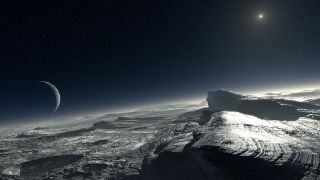 This was confirmed by matching telescopic observations of sunlight reflected from the surfaces of Eris and Pluto with the "chemical fingerprints" of certain molecules and atoms observed in ice samples of methane, nitrogen, argon, methane-nitrogen mixtures, and methane-argon mixtures grown in a vacuum chamber at temperatures as low as -390� Fahrenheit (-234� Celsius or 39� Kelvin) to simulate the freezing-cold surfaces of Eris and Pluto, which took two years of experiments in Northern Arizona University�s new ice research laboratory (DPS abstract; and Nancy Atkinson, Universe Today, October 6, 2010; Emily Baldwin, Astronomy Now, October 6, 2010; and Space.com, October 7, 2010). Larger black and white image. (latest news and press release). On September 10, 2005, astronomers and engineers at the Keck Observatory (including Marcos van Dam, David Le Mignant, and Antonin Bouchez) on Mauna Kea in Hawaii discovered that Eris has a satellite or "moon," using a new instrument which a resolution approaching that of the Hubble Space Telescope (press release). The moon has an orbital period of about 14 days and is only about 1/60th as bright as Eris, which suggests that the moon only has around an eighth of its diameter. Dysmonia appears to be quite dark. Astronomer Mike Brown's discovery team maintains a web site that provides the latest information on Eris. © 2005-2011 Sol Company. All Rights Reserved.